BTM: John Tron Davidson writing to you from BTM, and I’m here with Steve Weston of Raygun FX, guitarist for High/Low and builder of super ace things. Steve, thanks for talking to Break The Machine. SW: My pleasure – thanks for having me! BTM: Can you tell us when, where and why Raygun FX got started? 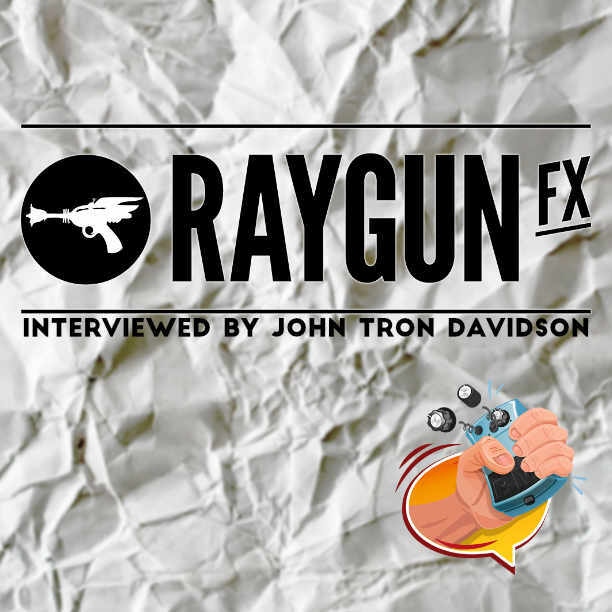 SW: Raygun FX came to life 6 years ago, and it started from a hobby. I’ve been playing guitar for 22 years and I was always into pedals, fascinated by different sound and effects. I got into repairing my own gear and guitars, and started making a few pedals for myself, out of being skint. I got into kits and learned to read schematics then I passed out a few to friends and it took off from there. BTM: How long have you been building and how did you get into it? SW: 6 years on the hobby side, then another 10 years of regularly making stuff and building things, thinking up ideas and so on. BTM: Can you remember what the first unit was that you ever made? SW: The first Raygun pedal was a booster – the Vintage Booster. It’s been redesigned over time. First ever was a RAT clone. I wanted to understand the pedal and how it worked, to learn about the sound. That initial Vintage Booster was based on the Super Hard On, which I understand was itself based on the preamp channel of a mixing console. It was a long time ago I read this story but I thought that was quite interesting. BTM: A lot of people know you from the outrageous Super Fuzz Boy – how did that come about? SW: A friend of mine asked me if it was possible to do it, so I accepted the challenge and built a one-off to test it out. I posted it on Instagram and it blew up overnight. The amount of emails and questions and stuff asked about it was unreal, it really did explode! Modding it to fit the circuit is the real challenge. None of the original internals remain. It’s got a PCB with and LCD screen that lights up. There was so much demand for it that I needed to make some, it would have been silly to miss this opportunity. BTM: Out of what you’ve built so far, what’s been the most rewarding build? SW: That’s a tough question! I suppose in terms of rewarding, when I first designed my own PCB’s and they came back and everything was working that that was the most rewarding part. All the pedals are so individual that they’ve got their own thing on the go. BTM: Although you hand-build everything, your pedals aren’t crazy money – was it a conscious decision to try and keep your prices affordable? SW: Definitely – that goes back to the question of ‘why did I start?’. Back then I couldn’t afford all the boutique stuff. I wanted to make mid priced pedals that people could afford, not make them too expensive. I’m aware of others charge double to what I do. It’s different if you make it yourself, or if you’ve got a team of people under you. It’s just me! Now and then my partner does help with boxing up parts – we had a little boy this year and that changed everything. You’ve got to keep it manageable and you’ve got to do a lot of work in terms of staging things and planning. BTM: You do a fair bit of custom work – what do you get asked for most often? SW: A lot of RAT clones funnily enough, and probably custom artwork and a lot of pairs in one enclosure. It can be quite varied but the most common is the RAT. BTM: What’s the most outlandish item you’ve been asked to craft? SW: The Game boy is right up there as something pretty crazy, but as for effects, there’s nothing too wild I can think of – I do get asked ‘can you make a multi or tuners’, that’s quite a common question really. You’d think with the affordable tuners out there people wouldn’t say that! Multi with delay trem distortion probably into a small enclosure, MXR-sized. BTM: Who’s playing Raygun FX? SW: I’ve made pedals for Tim Wheeler from Ash, Bloc Party, Snow Patrol, Tim Smith from Noel Gallaghers’ High Flying Birds, Grant Nicholas from Feeder. I’ve seen him posting pictures from the studio recently and he’s been using Raygun. BTM: You’ve got a record out with High/Low called ‘Skeletons’ through InStereo Records – when did you sign with them/what’s your involvement with them? SW: It’s run by a group of friends and I do artwork for the label. It started in 2009. I also play drums for Spun! BTM: What setup did you use to make that record? Did you only use pedals you’d built yourself? SW: Apart from a Russian Big Muff, I used a Soda Drive +, the Beastmaster Deluxe – which has a starve extra footswitch on it – that’s an extension of the Tonebender fuzz. A lot more velcro-y sounding, like it’s being pulled apart. I also used the Aurora Mk II, and the Ghosty modulation. That started off as a tape delay with modulated tails, and I ended up with delay part out and using the modulation side. It’s a different way of looking at a chorus/vibe mod effect similar to tape delay warble. There’s two different versions, one with a blend control/shape mode, and the simple two knob version. I run into an Orange Crush 120 2×12″. It’s a happy medium for moving around, it’s big enough and powerful but not huge. BTM: How long have you been playing with High/Low? SW: Since 2011. 3 albums and 3 ep’s. We don’t gig as much as we used to, we had a bit of a break as I was getting more into the pedal business, and we got back into the swing this year. Next year should be more on the horizon for us gig-wise. I use a Jazzmaster mostly, but I got a Strat for this time around, with a (Seymour Duncan) JB in the bridge. Something about it just drew me to it. Usually the Jazzmaster is the main guitar. BTM: What have you got on the bench at the moment? SW: At the moment I’m building a custom Meatropolis, and an Echohead delay I’ve been working on for a little while. BTM: Who are you listening to at the moment? The Living End, Superchunk, a bit of Bob Mould. I love Sugar – growing up with stuff like Green Day and that you know, I got into it from there. BTM: What’s it like being a boutique builder at this point in time? SW: Even I’ve noticed more builders, forums popping up, more accessible, to build yourself is there. More people are looking at boutique effects and it’s not as expensive – even ten years ago if you saw someone with a handmade pedal it might not have been the same reaction. When I first started playing it was all about BOSS, but now there’s a lot more variation out there, both cheap and expensive! BTM: Thanks so much for taking the time to talk to us Steve, it was a pleasure. Check out our Full Chat with David Rainger of Rainger FX here.